Oh Snap! The Friggin Amazing J.Ho Sketchblog...: Another Dude With An Axe! Another Dude With An Axe! On the one hand, I think I more or less got across what I was trying to with this piece. On the other hand, I think it greatly suffers because I have not yet posted an illustration of He-Man proper, for comparison. I need to remedy that soon. In the meantime, I'll just have to point out the differences that would be apparent if I'd had the foresight to finish a pic of He-Man first. Lame! Anyways, where He-Man has blonde hair and orange (copper?) bracers & belt, Battle-Scar is strawberry blonde, and has gold bracers & belt. I've given Battle-Scar pale skin and blue eyes, in contrast to the cartoon version of He-Man, who had dark eyes, and deeply tanned skin. The idea was to give Battle-Scar more of a Celtic or Nordic look (which is where his title of Berserker comes in as well). In terms of facial features, the cartoon depicted He-Man with more or less classic good looks--in comparative nerd terms this means that if you ignore his coloration and haircut, he pretty much looks just like Superman. I gave Battle-Scar a face that was a little closer to the rough-hewn looks of the toy. His armor is slashed and dented, to represent the battle-damage gimmick of the toy, and the scars on his body were added to continue the theme and give a visual cue as to his ability to take punishment (more in the profile below). On its own, I think this character re-mix comes off as just a version of He-Man, but once I post my take on He-Man, hopefully the differences will be more apparent. My drawing is a little static, but hopefully it gets across the idea of raw power that I was going for. No characters with axes next week--I promise! PROFILE: Young, loyal to a fault, and still somewhat naive, BATTLE-SCAR is nevertheless a veteran of the battlefield. Even before he obtained his magical breastplate, Battle-Scar was well known for taking heaps of punishment on the battlefield. His immense stamina and resistance to pain are magnified to demi-god levels by the breastplate. Ostensibly, Battle-Scar was the first member of the entity that would become affectionately known to the populace of Eternia as TEAM GRAYSKULL, named so by Orko, much to the chagrin of their reluctant field commander THUNDER PUNCH. 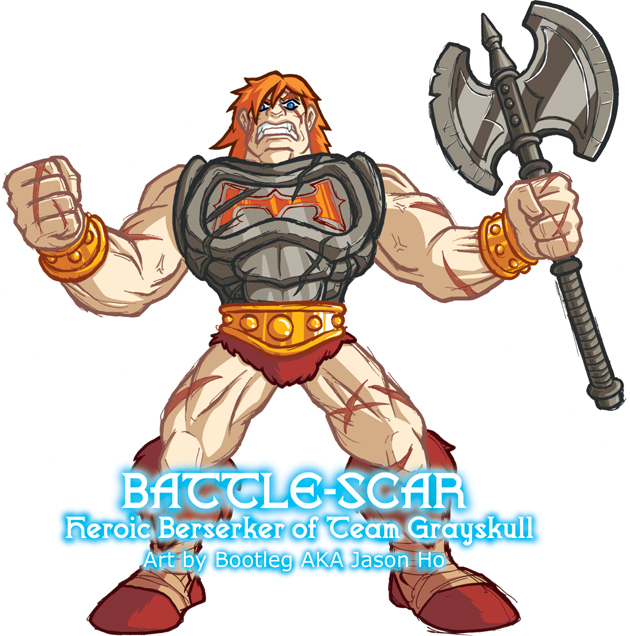 It is notable that Battle-Scar is the only member of the core team who is not a blood descendant of King Grayskull. HISTORY: Years ago in the northern lands, the boy who would become known as Battle-Scar watched as He-Man saved his village from a brutal attack by Skeletor's forces. This left an indelible mark on the youth, and he strove to live up to He-Man's example of bravery and honor. Thus when word of He-Man's disappearance spread, Battle-Scar (now a young yet experienced warrior) wasted no time, travelling to Eternos immediately to pay his respects to his missing (and possibly fallen) hero and offer his axe in service to Eternos and Castle Grayskull. Initially He-Man's allies were unsure of what to do with the young scarred warrior who stood before them. Teela decided to consult the Sorceress, and was bringing Battle-Scar to Castle Grayskull, when they were attacked by a platoon of evil Horde robots. Teela and Battle-Scar managed to fight them off long enough to retreat into the safety of Castle Grayskull's dark halls. However, more Horde Robots were on the way, Teela had been gravely injured during the battle, and Battle-Scar's axe was shattered, and his armor was blasted to pieces. The Sorceress saw to Teela's wounds and lead Battle-Scar into a room pulsing with magical energies--the armory of King Grayskull himself! "According to prophecy, only the just and even-handed--those worthy of King Grayskull--may wield these implements of war," the Sorceress told him, "choose wisely, young warrior!" Battle-Scar was humbled beyond words--he could not bring himself to even touch the magnificent arms and armor before him. Everything was elaborately crafted and intricately inlaid with precious metals and gems. He spotted a dusty breastplate and axe in the corner; unlike the other items, these were plain and ungilded. The axe was rough and worn from use, the breastplate marred by slashes and dents, and marked with an ancient heraldic symbol of Grayskull's line. In spite of their obvious wear, both were sturdy, and well-crafted--they would serve his purpose. Battle-Scar hastily equipped the breastplate and axe, promising the Sorceress that he would return them as soon as the battle was over. As Battle-Scar ran to the Jaw-Bridge, the richly crafted weapons shimmered and faded--in their place was a collection of humbler, and yet more powerful implements--like the axe and breastplate that Battle-Scar had chosen, these were the true weapons of Grayskull's armory. Sorceress smiled to herself, "Well done, young warrior." Now armed and clad like a god of war, Battle-Scar dispatched the Horde robots easily. After the battle, Battle-Scar attempted to return his newfound weapons. The Sorceress explained to him that he truely was one of Grayskull's chosen defenders, and Battle-Scar pledged himself to defend Castle Grayskull until He-Man returned. In case anyone didn't pick up on it, the whole "choose wisely" bit is totally lifted from Indiana Jones and the Last Crusade. You take me back yet again!! Somewhere back in time "Grade School Vinny" is giving you a thumbs up. It's as if He-Man got it on with Strawberry Shortcake and had Battle-Scar! (p.s. : he got his scars from the paternity suit and other various court battles). it that your BF?.. I bet it is... haha.. nice drawing man... but I wanna start seeing some mixed action poses and perspective changes... I know I am one to talk, but for serious though. lordshen: did they go to a real court to settle the paternity suit? or just "judge judy"? illgnosis and jamilyn: thanks guys but... mixed action poses? perspective? battle scenes? group shots? you guys are dreamers! okay, maybe.